SALVESTROL PRODUCTS ARE ONLY AVAILABLE FOR DELIVERY IN UK. An enzyme unique to cancer cells that represents an important therapeutic target for cancer treatment led to work that identified salvestrols. Found in abundance in some natural fruits, salvestrol in these fruits has now reduced to 10% of that present 100 years ago. Salvestrol compounds are dormant when in contact with healthy cells but become active when they interact with a damaged cell and set about a process that leads to the self-destruction of that particular cell. There is a difference between antioxidants and salvestrols in that antioxidants protect our cells against DNA damage but are ineffective once the damage is done. Salvestrols, on the other hand, work beyond antioxidants by working only on damaged cells which leads to that particular damaged cell's destruction. Difficult to obtain from our modern diet they are now available in Salvesterol Shield as a dietary supplement. 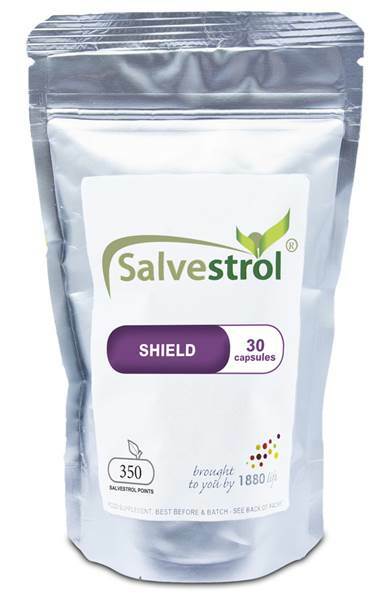 Salvestrols Shield is a blend of bitter orange, grape, blueberry and blackberry fruit extracts in a vegetarian hard gelatine-free capsule.